Boris Gaspar brings to this site a life-time of experience in the baking industry. From Artisan baker and business owner to over 20 years teaching baking at technical college. Boris has also travelled to Europe several times to learn from the masters. His quest is to help professional and home bakers create the best sourdough bread. Kon Gaspar, Boris’ brother is an IT professional by day but in the early hours of the morning, once a week, he bakes sourdough bread for his family. Boris initially taught Kon the skills to become a sourdough baker and Kon has amended the lessons to suit the home environment. Together their goal is to bring the expertise of a master baker into your kitchen. Boris regularly shared his beautiful sourdough bread with his extended family. His brother, Kon decided that he couldn’t go back to ordinary bread and started to learn how to make his own sourdough bread. “I figured I’d be stretching the relationship a bit too far if I expected Boris to be my life time supplier of the “good oil” and given he’s a such a great teacher then surely there was hope for the likes of me” said Kon, describing his initial motivation for starting the sourdough bread journey. Initially Kon relied on scraps of paper where Boris had carefully laid out the recipe. That quickly metamorphosed into a spreadsheet. “I pretty quickly realized that doing calculations on paper every time I wanted to make a change was way too painful (programmers hate doing anything like that more than once), so with Boris’ help we put together a spreadsheet to automate the process.” The spreadsheet performed all the basic calculations needed when adjusting a recipe expressed in bakers percentages. With sourdough baking, timing is everything and Kon developed an Android app to create alarms to remind him when to perform all the basic steps. “My biggest problem was always remembering to do the next step at the right time. Especially when you’re coding and in the zone, suddenly I’d realize that I’d gone an hour over the bulk fermentation time and have to call Boris for instructions on how to recover the situation.” All the alarm apps on the market were geared towards single events, Kon’s app needed to treat all the alarms (often over 10 per recipe) as one schedule that could be shifted forward and backward as needed. Eventually it became obvious that a more sophisticated app was needed to store both the recipes and the alarms together. Over a period of almost three years they evolved the design of the Android app to create Bread Boss. “Bread Boss comes with a set of supplied recipes that are tested and useful for those new to baking. However the real power of the app is for those who create recipes. They can develop a formula and apply it easily to 1 or 1000 loaves. They can alter the percentage of an ingredient and easily see how it affects the rest of the recipe.” says Boris. 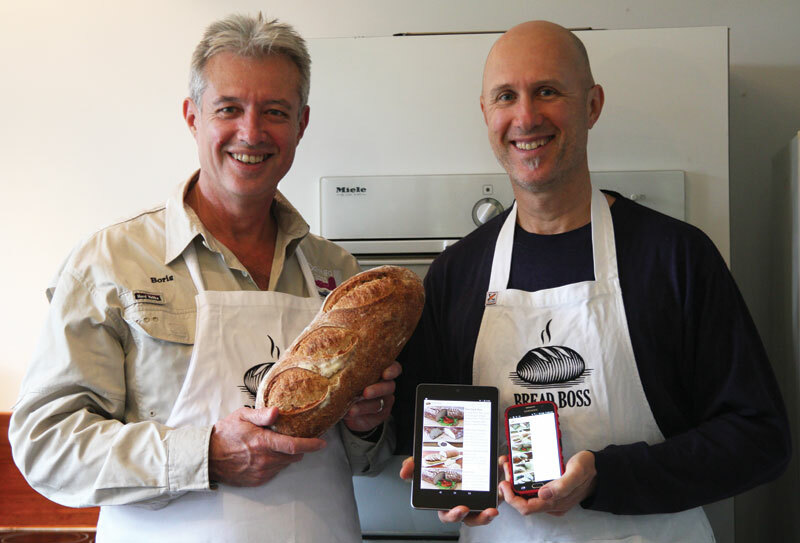 “The app became a family affair with my son Lukas naming it, my daughter Jessy designing the logo and website and my partner Karen developing the website and testing the app and recipes.” says Kon. When they tested the app with some beta testers from the Google+ group Art of Bread it became obvious that the home baker is not used to using baker’s percentages or treating a bread recipe like a formula. Kon added a switch that allowed the ingredients to be entered in weights and the percentages are then calculated automatically. The app gradually evolved to handle all types of bread. “The app is a useful tool for professional bakers, chefs who bake and home bakers.” explained Boris. The app is available on the App Store for iphone/ipad users and on the Google Play Store for Android users. If you have any queries please contact us on 0414 436 239 or use the following form.